This is an odd sort of issue to me. Partly, it’s weighed down a bit by my knowing what’s coming. Then there’s it being very ’90s in look and feel. 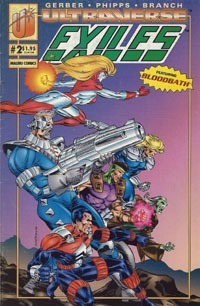 The cover is a generic shot of the Exiles team, including Deadeye with the gigantic gun…but we don’t get to see who they’re facing. 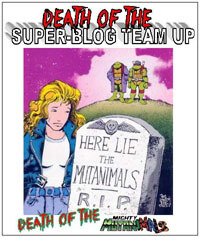 And the only "blurb" on the cover is "Featuring BLOODBATHTM." (Yet, while Bloodbath is IN the issue, he’s not the core antagonist!) To say that this is NOT a favorite cover of mine is probably the best way to put it without getting too negative. We pick up from the previous issue, where Exiles Catapult and Mustang have failed to accomplish their mission–of saving Timothy Halloran. He’s been kidnapped, and his mother killed, while they were unable to prevent either. They have to make an escape, as the police have shown up, and they look to be the cause of what’s happened. Bruut winds up not being nearly as out of it as they thought, and they have to fight him along with the police. At Stronghold (the Exiles’ HQ) Amber Hunt freaks out again, and is informed of the fact that she has to make a choice soon or risk the Theta Virus choosing for her. The rest of the team catches the news…they’re getting "bad press" for the situation. Elsewhere, Kort and his crew try to get Timothy to join up, and his body is mutating, apparently with an "unprecedented" amount of Theta activity. As the Exiles prepare to head out to try to rescue Timothy, Amber decides to go through with the treatment…but now has to wait til they come back. At Kort’s, Bruut has it out with Bloodbath for being left behind. Elsewhere in the building, Kort’s tinkering with Timothy goes very wrong, with an explosion unleashing him, apparently changed into a large hulking creature–Mastodon (based on the "NEXT" blurb). The art for the issue isn’t all that bad, though nothing particularly blows me away. I was actually most caught up by a page where I actually chuckled as I took it in–we have a full-page panel of Bruut taking massive fire from the police. And all I could think about was that the letterer apparently got to have a lot of fun with the "visual sound-effects" on the page with the various colors, visual effects, and the "words" themselves. This entire issue LOOKS LIKE a ’90s comic. Story-wise, it’s good that we pick up where the previous issue left off, and get to check in on the various plots/subplots going on. There’s general forward movement to the story, and we even end on the introduction of a new ultra-character in Mastodon (though we only get the name in the next issue blurb). However well-intentioned the Exiles are, they sure are shown to be inept or ineffective, continuing to fail at their mission(s) and getting stuck reacting rather than proactively handling stuff. All told, this issue was a bit of a chore for me to get through. It’s not some horrible issue, but it just felt a bit out there, felt a bit "too" "’90s" for me, especially with Catapult’s speech pattern. 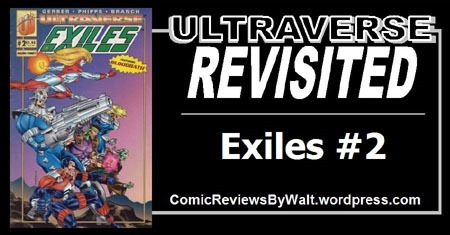 This issue is not indicative of the Ultraverse as a whole, and not one I’d really recommend pursuing–certainly not as a single-issue in isolation; the main reason to read these early Exiles issues is for what they set up and show us heading into the first major crossover/event in a couple more months. Still, as part of reading all these early issues, I’m glad TO have read it, but very eager to get through and back to the "original 3" for the September 1993 books.